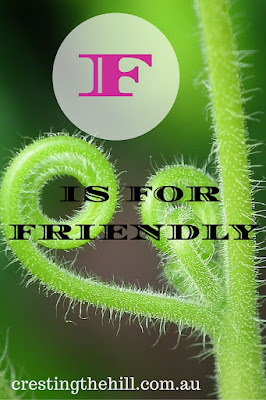 Next letter up for the A-Z challenge of Positive Personality Traits is F - and F is for Friendly. Everybody loves a friendly person - they draw others to them like a magnet because they like people and everybody wants to be liked. Friendly people are that way because they are interested in others, they aren't narcissistically self focused. They look outside themselves and find other people interesting, they listen and want to get to know others. They have a genuine desire to make a connection and move beyond the superficial. It's easy to like a friendly person because they are open and want to get to know you. They take the time to make eye contact and find commonality with those they meet. They invest in their friendships and value those they are close to - they go the extra mile to help out a friend in need. They prioritize their friendships and find time to get together and deepen the connection. In today's world of disposable relationships, friendly people are to be valued. Friendships become more important to us as time goes by, and those who value our friendship are the people we want to spend our time with. The self focused and self important contacts in our lives are the ones who get discarded along the way, we hold tight to those who are truly invested in friendship. Friendship is a two way street, we need to be friendly and we need to find others who return the sentiment. Everyone needs friends - they can be our lifeline in tough times, and our cheer squad in the good times - let's make being friendly a quality that's high on our list of positives. See you next time for the continuation of Positive Personality Traits - G is for Gracious. You're doing an awesome job with the challenge! I'm really enjoying it. So sorry I've been missing for a while! This is a fun challenge. Yes like all other relationships even being Friendly is a two way process..
it is indeed Deepti - you reap what you sow - building into friendships is so important. I agree Sue - we need those friends who cheer us on and encourage us - without them our lives wouldn't be as rich. I'm not good at friendly....I'm in the polite and cautious camp. But going to try harder! I think it's nice to have a few friendships to invest in Mimi - I don't have a multitude of friends, but the ones I do have are valued beyond measure. Friendship is surely a two way street and yes at the end of the day we all need friends! I'm not sure what I'd do without the friends who support me Srivi - they are such a blessing. That is so true Leanne! Finding good friends and maintaining friendships is very vital for a happy and fulfilling life. Friendly people are a treasure indeed that one needs to cherish and hold close. Lovely thoughts. I'm finding the friendships I've made in this phase of my life are so much deeper than the ones made in my younger years. And each is a treasure. I'm the same Lisha - I have a few golden oldies that I've hung on to, but the friends I have now are worth their weight in gold! Good reminder as I head to a conference where I know NO ONE! Reach out & be friendly! My favourite quality in anyone! 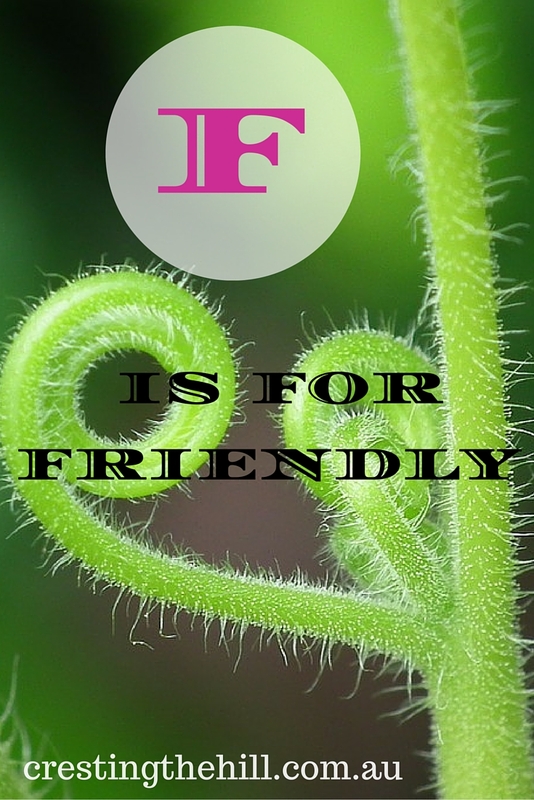 Friendliness! Friendly is the best F word! I think it's a popular one for the challenge and way better than some of the other "F" words you hear Ellen! I love your theme! I used friend for my A-Z F word:) Good luck with the challenge! Friendly. It's important to reach out to others and it's surprising how many peopled don't do that. I know Carol - it costs nothing and makes the world a much nicer place. 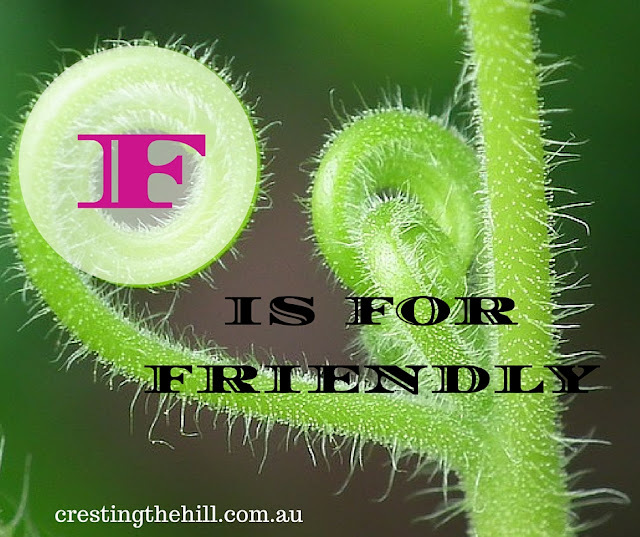 Friendly is a great positive trait and fantastic F word. Mum was always complimented for having friendly children. the sign of great parenting if you have managed to have kids who are friendly to others Ida - she did well! My favorite F word! Yes, it goes both ways... which can be hard. I've always told my (now adult) daughters "You have to BE a friend to HAVE a friend." Even just a friendly smile goes a long way. Great post! 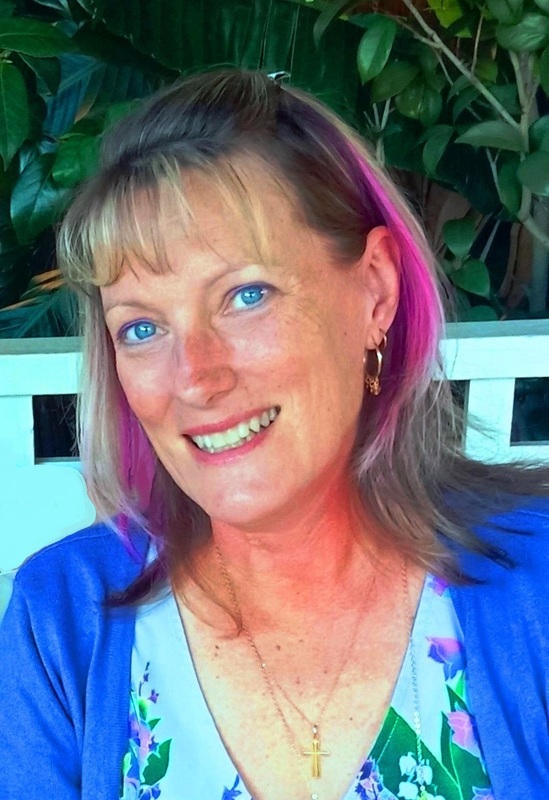 thanks Lisa - I think smiling and showing interest gets you past the first hurdle and then once you engage with people they reciprocate - friendly people are such an attraction. Friendly should be the base line. Wouldn't it be just a wonderful world if our baseline response to new people and friends was friendly? Love this one! The world would definitely be a better place if everyone made an effort to be a little friendlier to each other. This is the first post I've read in your A-Z challenge and it was great one! I'm glad you liked it Janie and I hope you pop back to read some more! Genuinely friendly people are gold! In this grumpy, self-absorbed society, it's always a nice surprise to find a friendly person. It's also rare to meet someone who becomes a true and loyal friend and that should be nurtured, always. My closest friends and I go back decades.